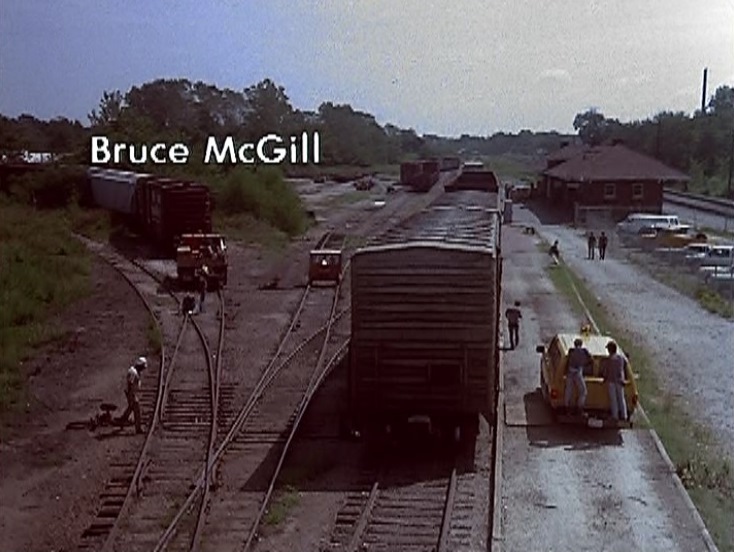 I remember seeing this movie in the theater when it first came out and nitpicking it to death with all the railroad inaccuracies. 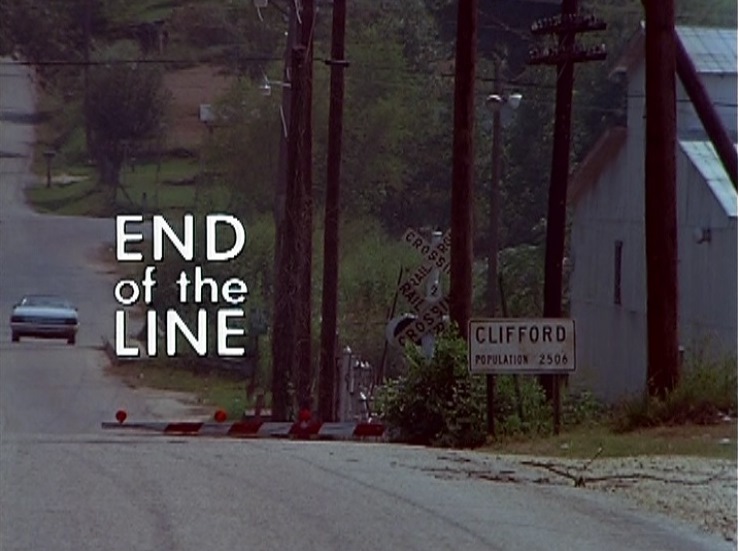 A recent revisit to this flick confirmed its wretchedness. 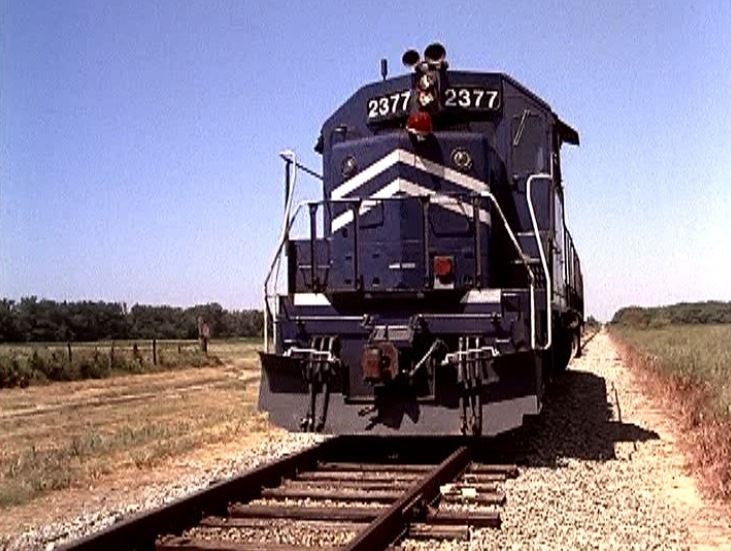 But, hey, it’s got a train (mainly just the Missouri Pacific EMD GP38-2 #2377 shown above) and filmed in Arkansas, so it is obscure as can be. 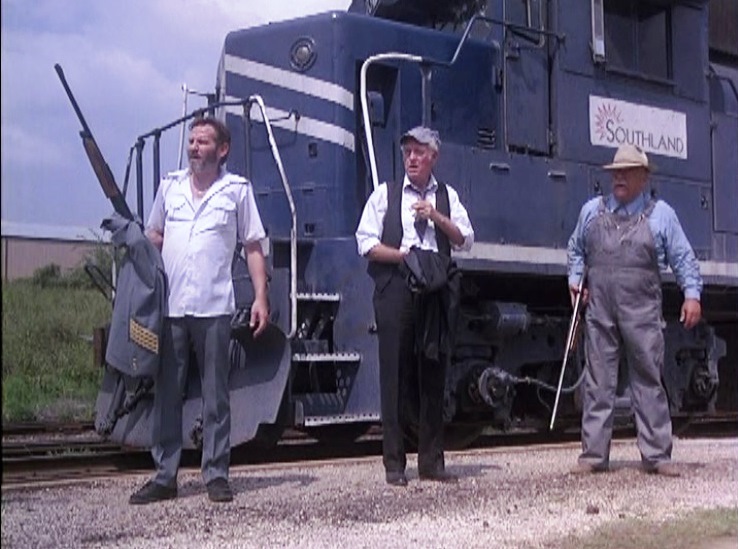 Dressed in railroad/roundhouse garb are residents of Pine Bluff, Arkansas and the Cotton Belt Historical Society posing alongside a “Southland Railroad” 4-8-4 (Cotton Belt 819 in disguise). 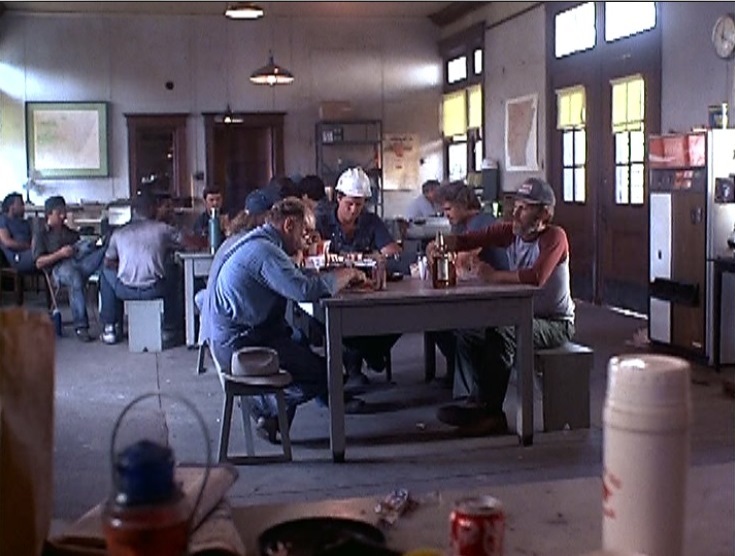 Establishing shot of the depot and little yard in ficticious Clifford, Arkansas; Haney (Wilford Brimley) and the boys passing around the whiskey bottle inside the depot during lunch. 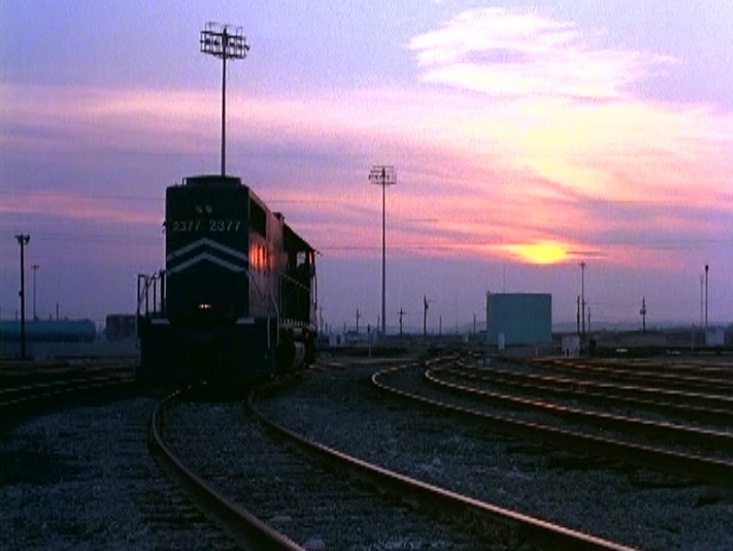 The movie’s entire premise is that the main office in Chicago wants to shut down the Southland Railroad and start running an air freight business instead. Huh? That’s quite a change in the old business plan. 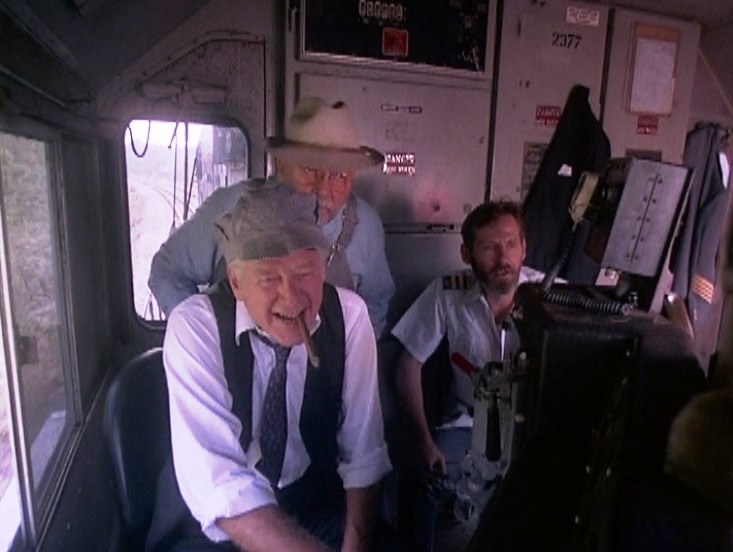 How do you haul bulk grain on an airplane, for instance? 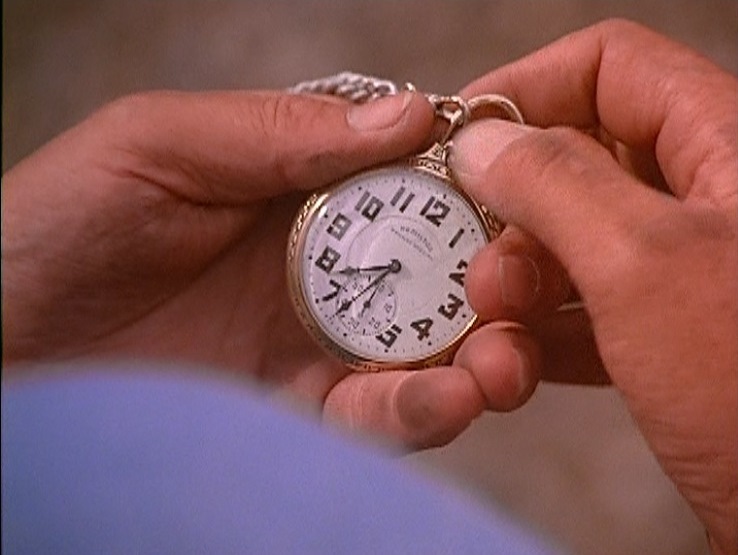 Anyway, suspend disbelief and we can get through this picture. 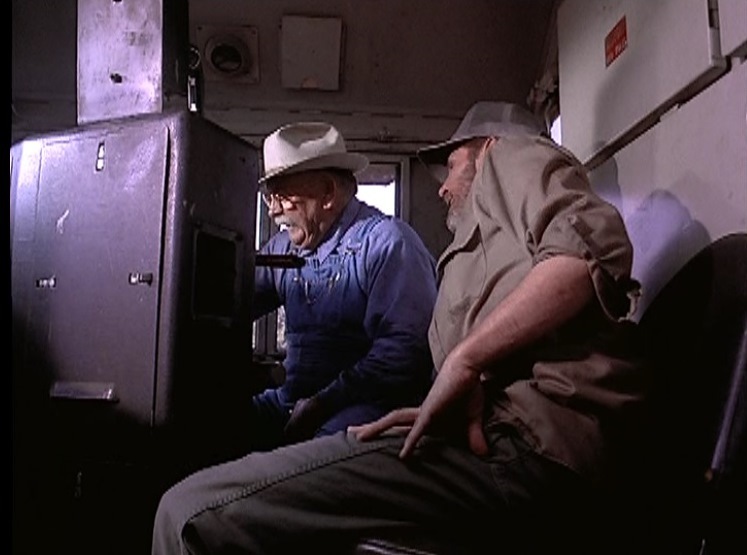 My DVD cover prominently features a photo of the annoying Kevin Bacon along with Wilford Brimley. Fortunately, Bacon only plays a small role in the picture so we can ignore him for the purposes of this review. 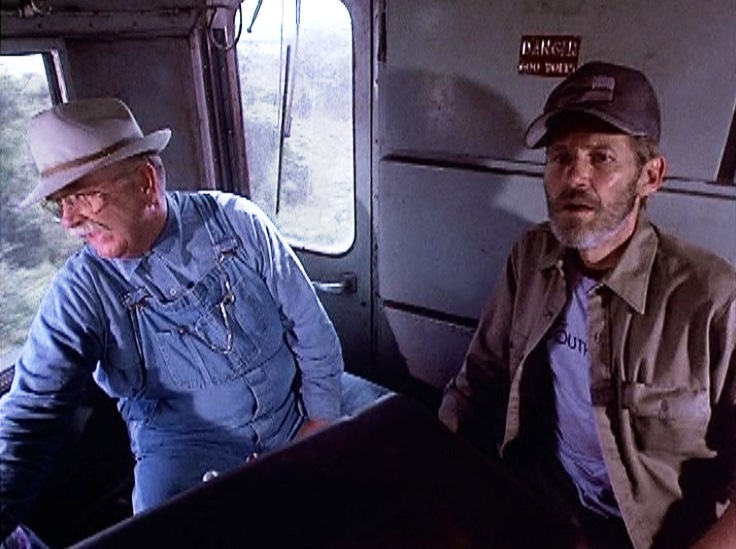 You are just NOT a railroader without your trusty Hamilton pocket watch; Haney and Levon (Leo Pickett) are the only two guys who show up after their railyard is shut down. 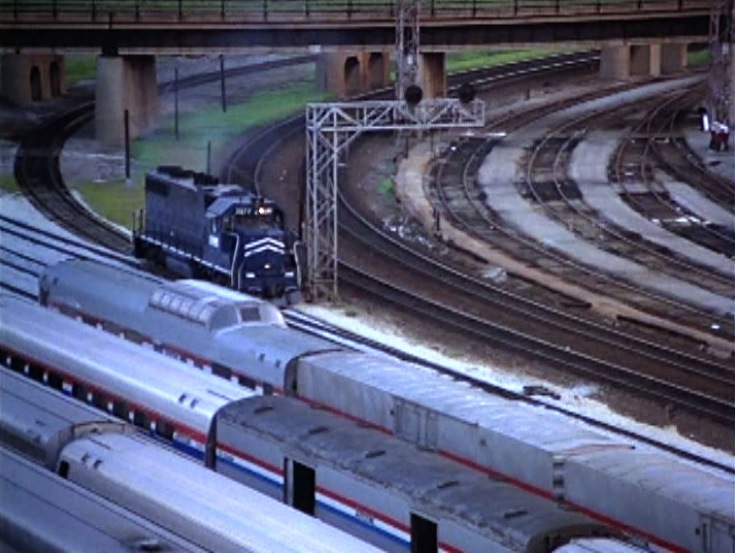 The boys decide to head up north and give upper management a piece of their mind. Road trip! 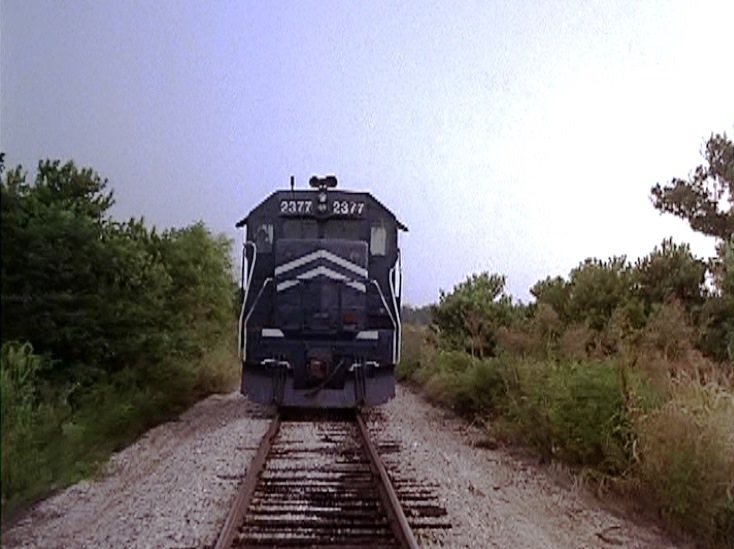 Sorry folks that’s NOT where you start up a diesel locomotive (it’s back on the side of the engine itself); Soon Haney and Levon are trundling their little Mopac Geep 38 towards Chicago. 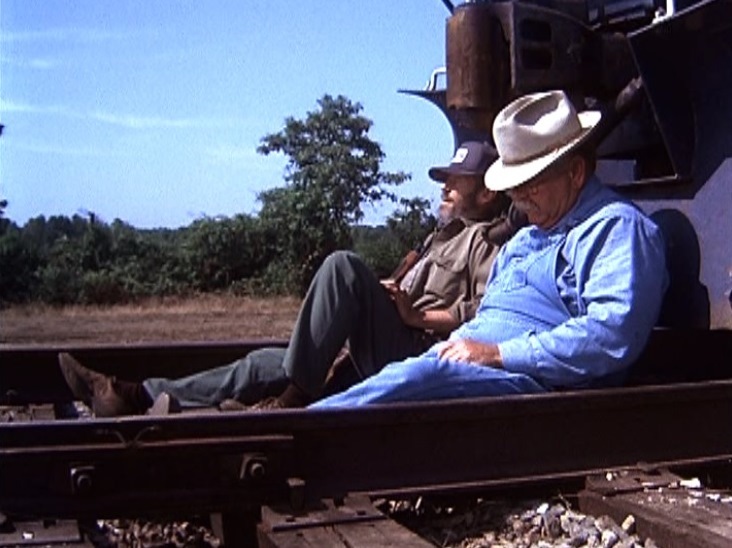 Rolling north go Haney and Levon. 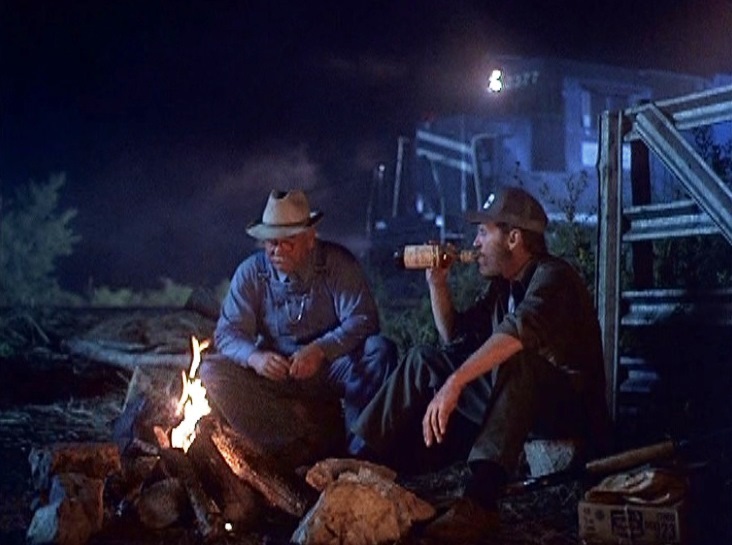 Oops, we’re out of gas; Well, back to the whiskey. 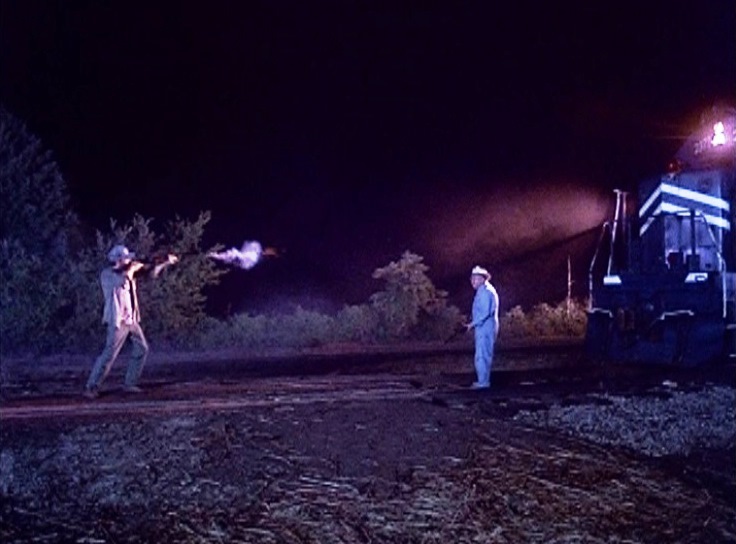 In a strange scene from the movie, Haney and Levon take pot shots at each other and the 2377. 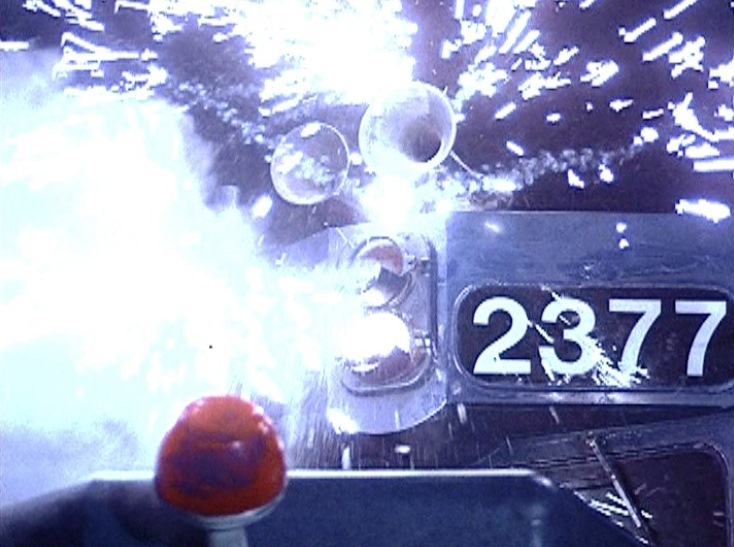 Nice fireworks, though…. 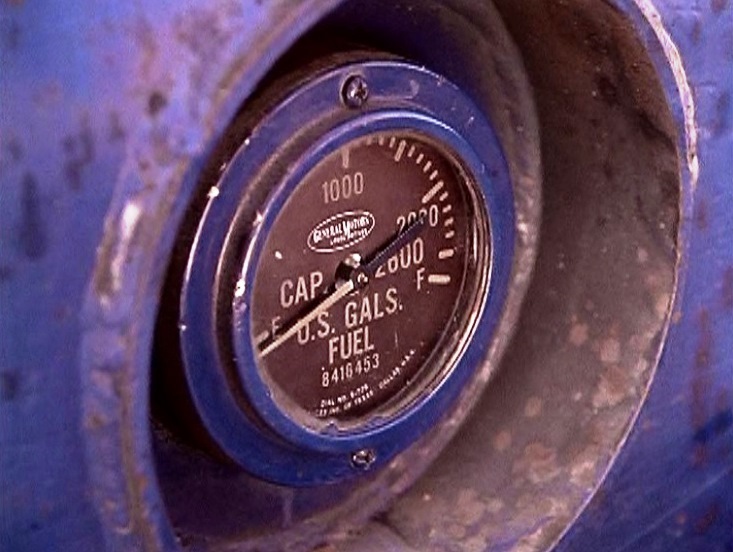 Comes the dawn….what are we going to do for diesel fuel? 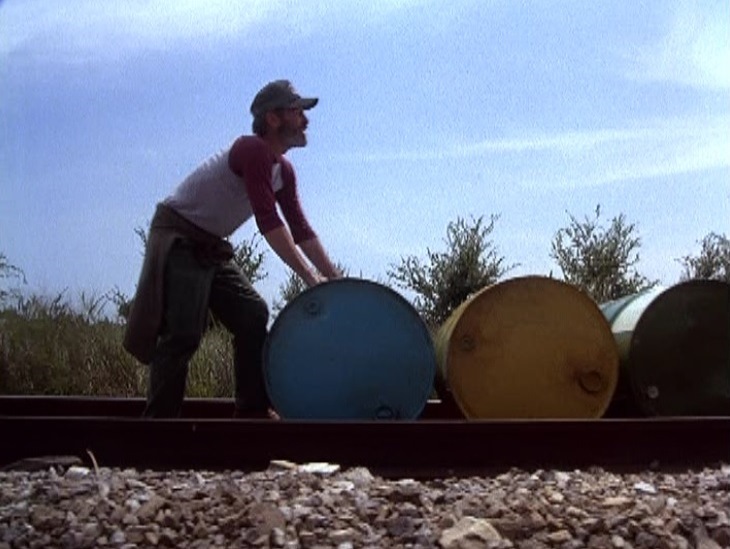 Why, we’ll buy 55 gallon drums of the stuff at the nearby Gulf station! 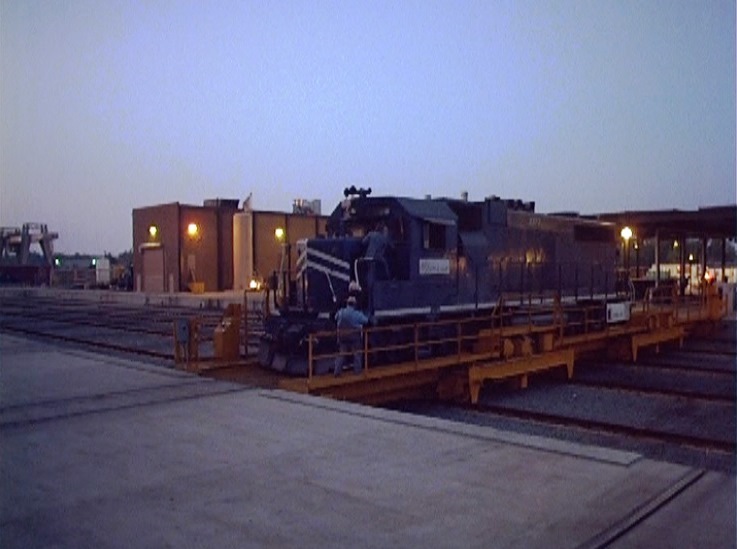 Nice twilight shots of the 2377 rolling through the big classification yard at Pine Bluff. 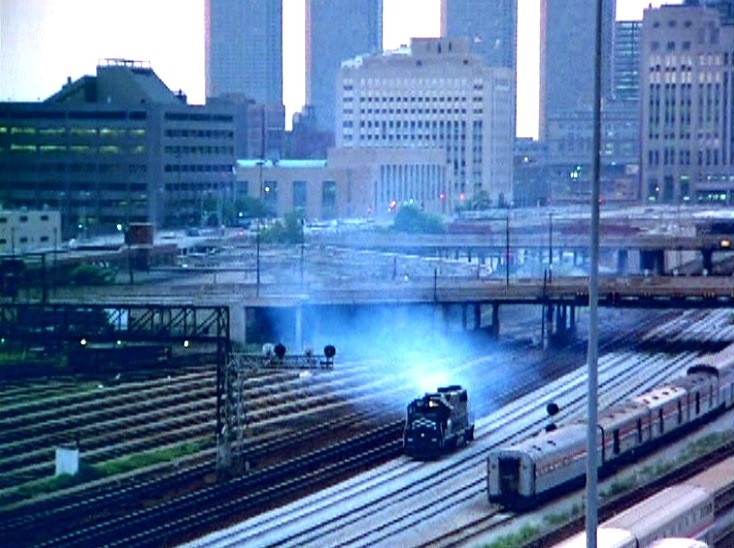 Finally, they reach Chicago. 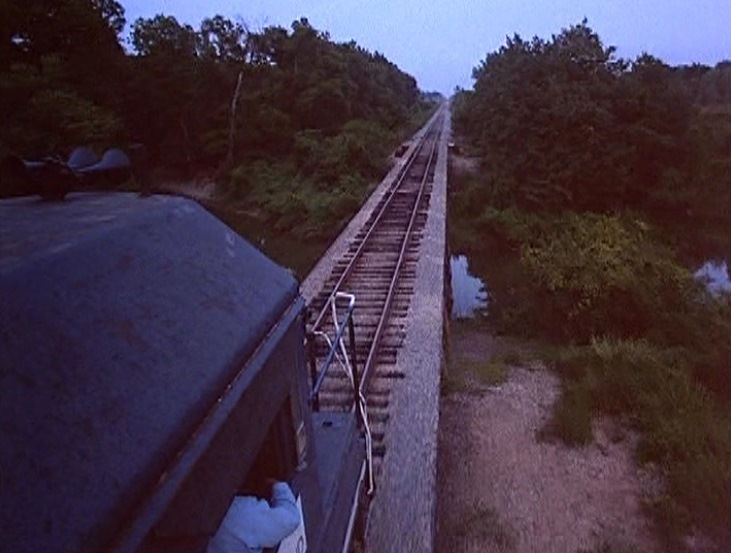 Note the dome car as they enter the yard. 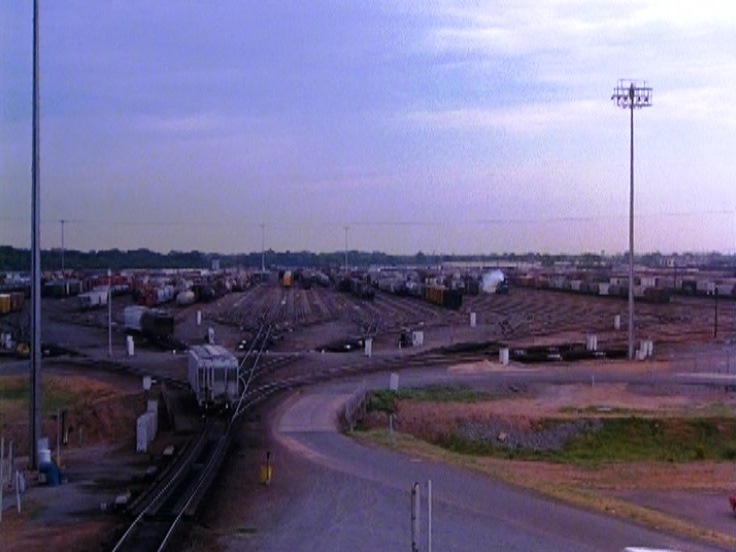 I’m guessing this is the transfer table and/or locomotive shop on the Cotton Belt at Pine Bluff. 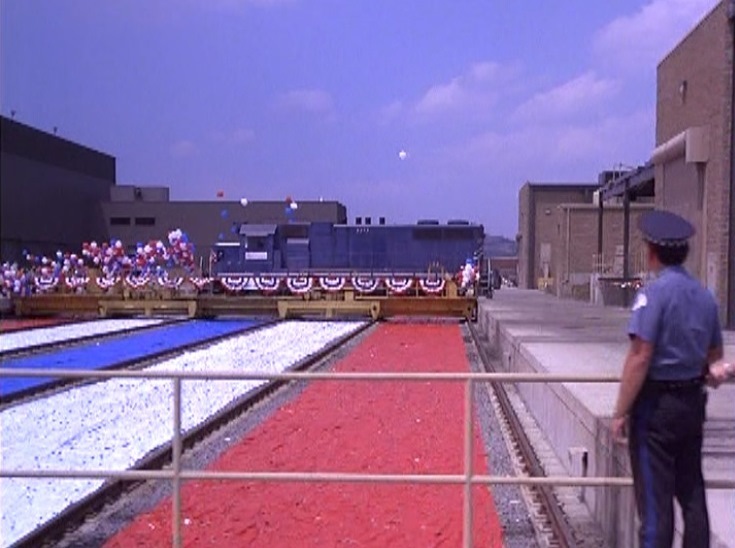 The red, white and blue ballast inside the transfer table pit is a nice touch. 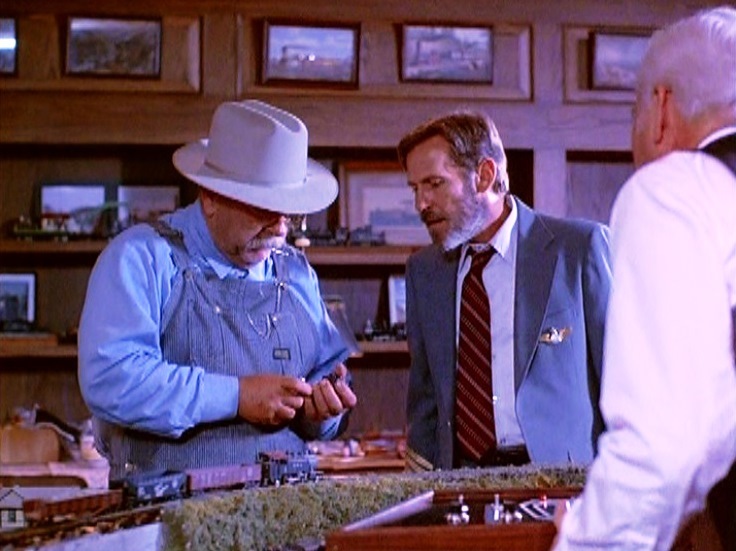 Levon and Haney finally meet up with Southland Railroad Chairman Thomas (Tom) Clinton (Henderson Forsythe); Haney repairs a model freight car — very nice model layout. 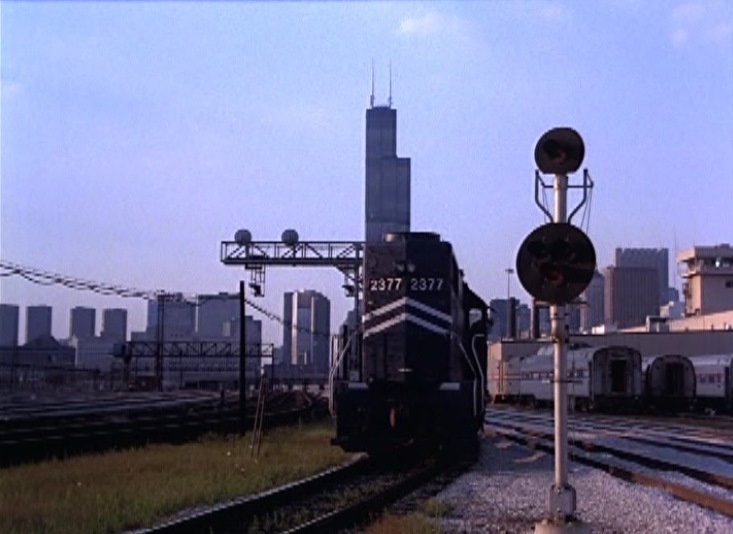 Soon Haney, Levon and Tom are hightailing it out of Chicago (note the colored ballast is now absent from the transfer pit). 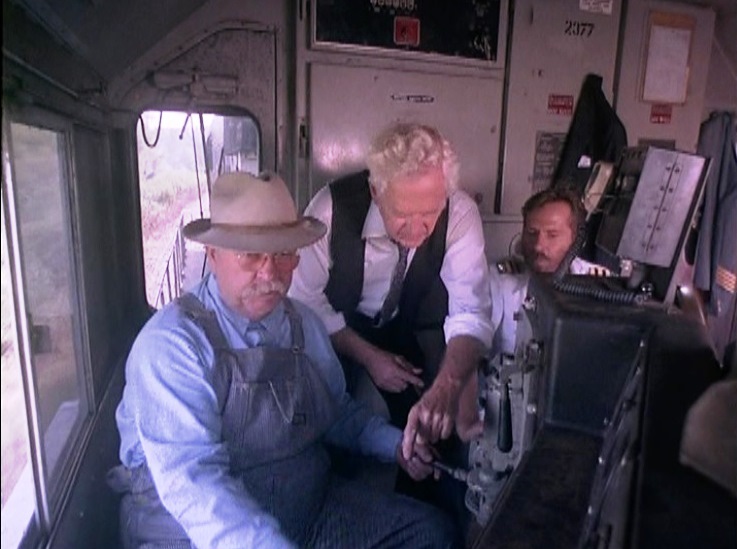 On the way back to Arkansas, Haney shows Tom how to run the engine. 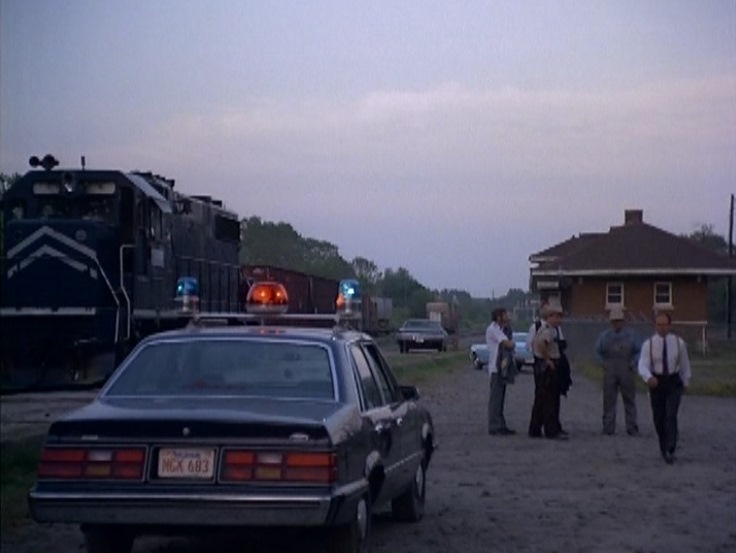 Back in Clifford, the boys meet up with the local sheriff. 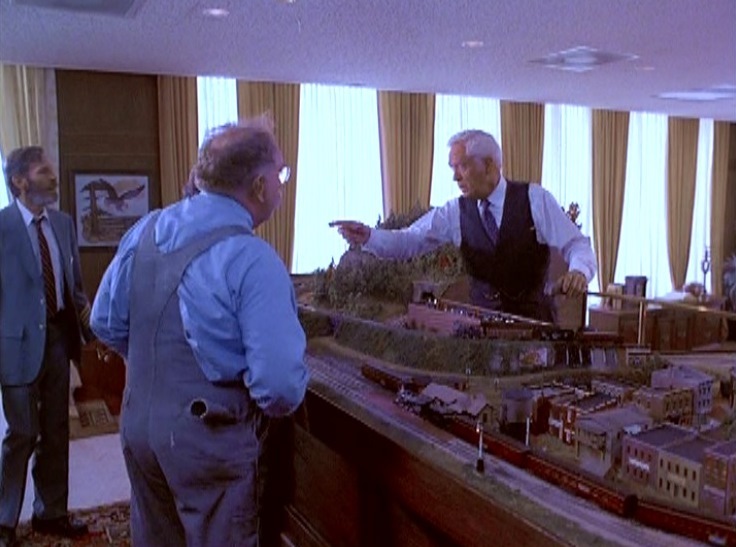 Attempts to have them arrested for trespass fail when they reveal Chairman Tom has sold them the railroad for $1! 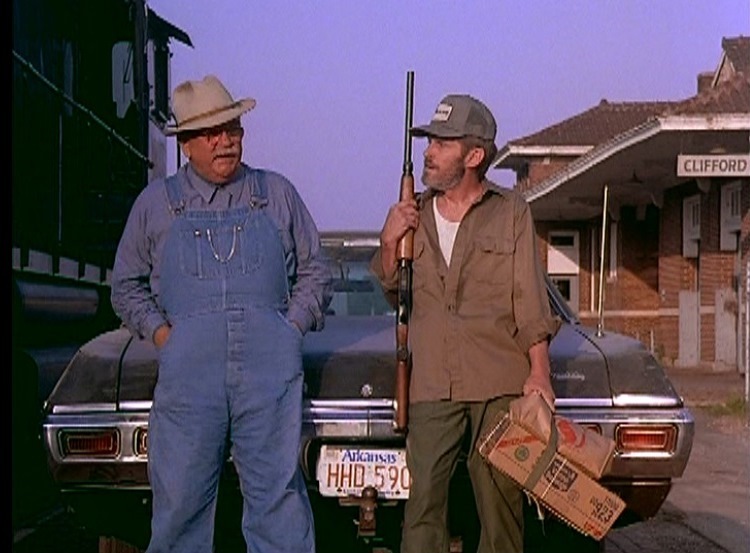 Despite its obscurity, the movie has a surprisingly well-known supporting cast of Hollywood types including Mary Steenbergen (who was also executive producer), Barbara Barrie, Holly Hunter, previously-mentioned Kevin Bacon and the always-gross Clint Howard. 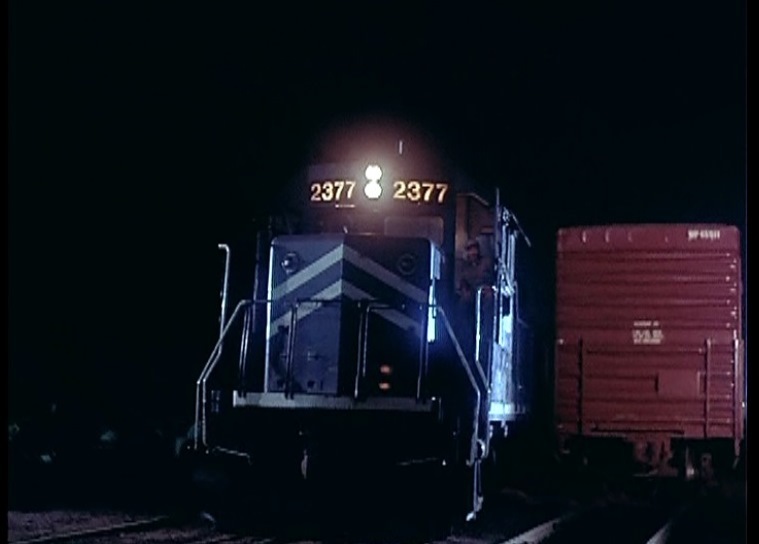 In addition, the music was composed and performed by Andy Summers of “The Police” fame. 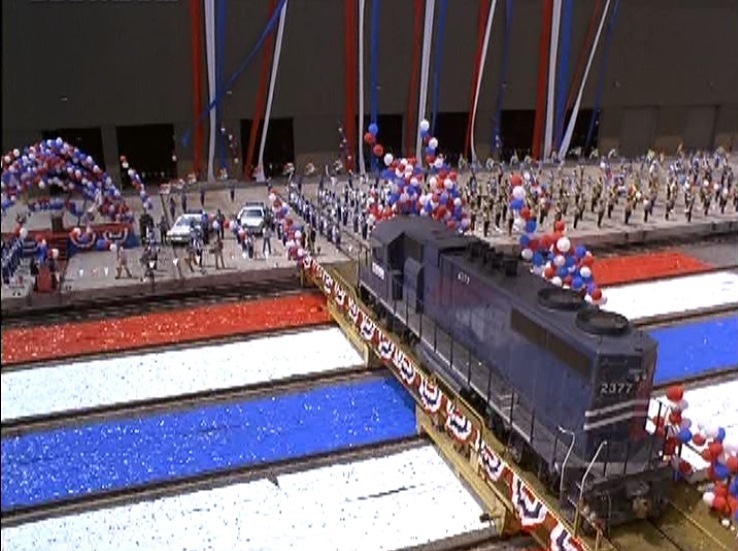 The credits also thank the office of Governor William J. Clinton (yes, THAT Bill Clinton – POTUS #42). 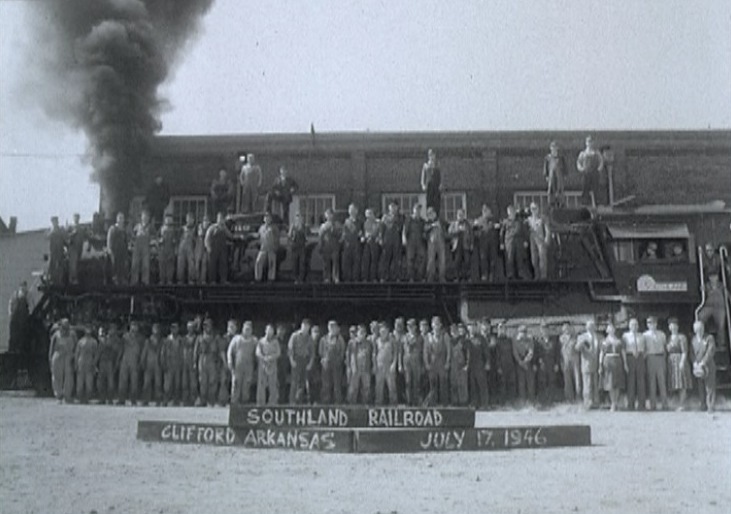 This entry was posted in Uncategorized and tagged Arkansas, Chicago, Cotton Belt 819, Cotton Belt Historical Society, Cotton Belt Railroad, End of the Line, GP38-2, Little Rock, Missouri Pacific Railroad, MoPac 2377, Orion Classics, Pine Bluff, Saint Louis Southwestern Railroad, Southland Railroad, SSW, Union Pacific Railroad, Wilford Brimley. Bookmark the permalink.